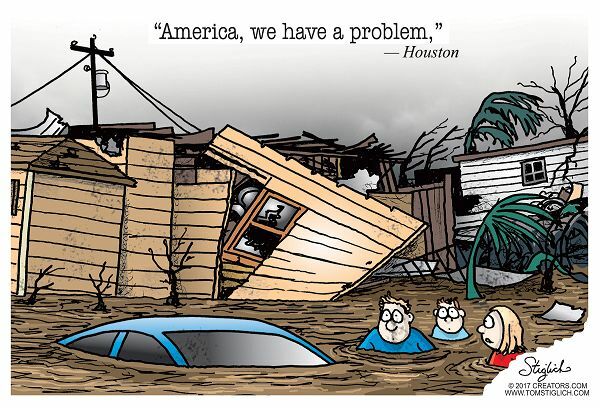 Even as Hurricane Harvey was battering Houston and Galveston, dumping volumes of rain all along the Gulf coast, the National Weather Service was describing this storm as “epic” and “catastrophic.” Indeed this storm was unprecedented as it danced its way along the coast for three terrible days, moving back over New Orleans before working its way inland, carrying its havoc with it. As that vicious storm is sweeping its way northeast across the landscape, yet a second storm, already named Irma, is already forming in the Gulf and weather people were watching it closely, noting that it is building into a Category 5 Hurricane and heading due West toward the Gulf. And Tropical Storm Lidia was slamming the Baja Peninsula and the west coast of Northern Mexico, moving due North toward the California coast. The extreme winds, heavy flooding, chemical plant explosions and deadly gas escaping from the damaged refineries has left the City of Houston and neighboring communities a disaster zone. Some analysts are saying the hurricane was the worst disaster in the nation’s history. As terrible as Harvey has been we are compelled to wonder it Mother Nature wasn’t sending an opening shot in a last-ditch attempt to wake a sleeping nation and its rebellious leadership to the looming horrors that our reckless way of life is about to bring down upon our heads. Then perhaps it is the beginning of the unstoppable horrors the science community has been warning us about. Houston’s primary industry has involved the refining of crude oil and the production of oil and gas. The massive refineries located there have been expanding in recent years to handle the volume of fracked crude from shale now being piped and trucked into Houston and Port Arthur. That this storm has effectively knocked these refineries out of commission and forced gasoline prices sky high is producing an interesting impact on nearly everybody’s pocketbook. That the oil and gas industry lobbied hard to get Donald Trump and his gang of climate change deniers elected to Washington legislative posts slaps a lot of blame for what happened last week on this industry alone. It isn’t that we were not warned. Top researchers have been telling us for years that our planet is warming, the ice caps have been melting, the water levels of the world oceans have been rising, and those waters are absorbing the heat. Those oceans are so vast and deep it has taken a few years for all that water to warm. But now that the waters are heated, the mild weather patterns we knew and loved are disappearing. In their place are coming intense storms and intense drought. The storms are bringing floods, destructive winds and rains so intense the world streams and rivers can’t handle the water. Winter snows are now being measured by feet instead of inches. It was earlier this year that Dan Jaffe, an atmospheric researcher at University of Washington Bothell, was quoted in Live Science as noting that warmer waters, ranging from two to seven degrees Fahrenheit higher than average, were measured from Alaska south to Santa Barbara, California. At the same time, Jaffre said he and his colleagues noticed that ozone levels at Mount Bachelor Observatory in Oregon were spiking. They measured ozone levels all along the Pacific coast and found elevated ozone levels throughout the region. The team found that a “blob” of hot water now formed in the Pacific Ocean is causing dangerous levels of ozone to form throughout the Western United States. Excess ozone causes inflammation of the lungs and other respiratory problems associated with asthma, throat irritation and shortness of breath. Scientific studies have shown that Anthropocentric Climate Disruption amplifies hurricanes. It causes larger storm surges, higher wind speeds and greater rainfalls, all driven by the amount of heat in the oceans. This was the first major hurricane to strike the North American coast from the heated waters of the Atlantic and Gulf this season. And it is only August. Can we expect more storms of this magnitude ahead? Is a second storm already building? Anyone living along the coast anywhere in the world should seriously consider moving inland. But then folks living inland are suffering from intense heat, tornadoes and severe storms with heavy rain. That is, of course, in the event they are in a drought struck area. Perhaps there is no longer a safe place on this planet to make a home.